Han Solo has moral dilemmas and moral development and a romance with a princess. Chewbacca has none of those things. Why? When I was a kid, Chewbacca the Wookie was my favorite Star Wars character. The appeal is pretty obvious; he's a big, superstrong, hairy fuzzball with an intimidating growl and a laser crossbow. If you're a 6-year-old, what's not to love? I still quite like Chewie — though as I've gotten older I've grown increasingly aware that the Star Wars franchise doesn't exactly adore him as I used to. When I was playing with Star Wars figures, Chewie would often get to be the hero; he'd even defeat Darth Vader on occasion, replacing the disappointingly unhairy and whiny Luke Skywalker. In the actual Star Wars series, though, Chewie has always been the sidekick and the helper. He’s generally not even the star of his own story. Though Star Wars sometimes translates alien tongues, Chewbacca's growls and roars are never written out in the subtitles. Instead he's always interpreted through his friends, a directorial decision that emphasizes his lack of consciousness and agency. The newest Star Wars film, "Solo: A Star Wars Story" is aware that poor Chewbacca doesn’t get enough respect, and tries to rectify matters — sort of. The newest Star Wars film, "Solo: A Star Wars Story" is aware that poor Chewbacca doesn’t get enough respect, and tries to rectify matters — sort of. 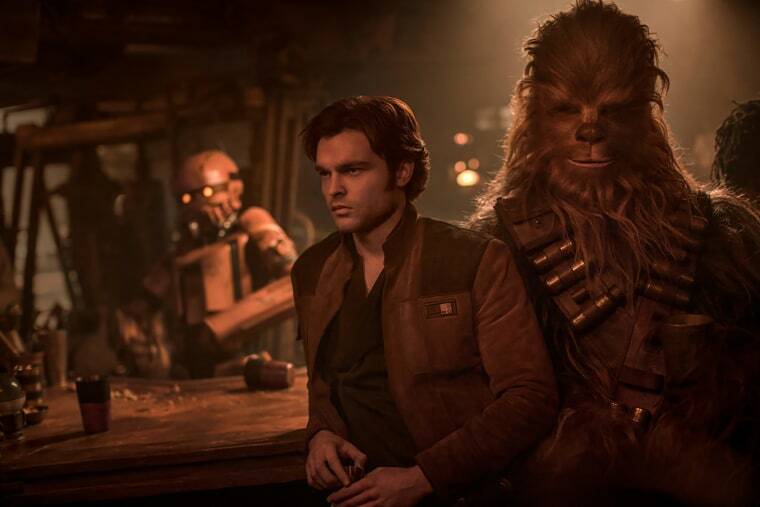 Chewbacca's motivations and background are filled in as they haven't been through most of the rest of the films, and he's also given some independence apart from his best buddy and captain, Han Solo (Alden Ehrenreich). Ultimately, though, letting us see a bit more into Chewie's furry head doesn't really make him a fully rounded character. Instead it emphasizes that the script sees him, somewhat helplessly, as a pet. Chewie was in fact originally based on George Lucas' beloved Alaskan malamute, and his main trait has always been loyalty. The first Star Wars film spends a good bit of time on the character arc of Han (then played by Harrison Ford), who goes from amoral rogue to courageous hero, in fine cowboy style. Chewie, Han's copilot (played by Peter Mayhew) is along for the ride, but never has much in the way of input. When Han decides to abandon the rebels, Chewie goes with him. When Han decides to come back to rescue Luke, Chewie does that too. Sometimes he growls in dissent, but it's always Han who makes the final decisions. Han has moral dilemmas and moral development, and, eventually, a romance with a princess. Chewbacca has none of those things. Decades later, in "The Force Awakens," he's still trailing around after Han, dealing with his partner's messy familial relationships rather than settling down with a family of his own. Even when we do meet Chewie's family in the execrable 1978 "Star Wars Holiday Special," we’re left with more questions than answers. In the special, Chewie has a wife and son back on his home planet, which is controlled by the empire. But if he's got a family living under occupation, why does he gallivant around the galaxy with Han? Why not stay home and be a hero among his own people? Recognizing that there are no good answers to these questions, "Solo" quietly but firmly erases the "Holiday Special" from the canon. Chewie (Joonas Suotamo) explains to Han (still via those untranslated grunts) that his tribe and family have been scattered by the empire. He joins Han initially to try to get funds to find the lost Wookies and free them. At one point in the story, when he sees a Wookie in distress, he briefly abandons Han to pursue his more important loyalties. Chewie's flash of character development actually occurs during a general rebellion of the series' minor characters. Like Wookies, robots in the Star Wars world are treated as servants and slaves — they're loyal retainers, rather than people with their own desires, goals and stories. Solo, though, features a robot who wants more for herself. L3-37 (voiced by Phoebe Waller-Bridge) is a pilot-droid under the command of smuggler Lando Calrissian (Donald Glover). She's also a smart-talking, militant feminist rebel. At the same time as Chewie sets off on his own, L3-37 encourages other droids to cast off their restraint bolts and overthrow their imperial masters. The marginalized and disrespected races of the Star Wars universe all at once make a bid for freedom and self-respect. That bid for freedom and self-respect is mostly treated as a joke, though. L3-37's revolutionary rhetoric is supposed to be more humorous than inspirational, much as you're supposed to smile patronizingly at Dobby the House Elf in "Harry Potter" when he says he doesn't want to be a slave any more. In staging a droid slave rebellion, the film emphasizes that droids and Wookies narratively parallel the position of minorities in Hollywood. Chewbacca's relationship with Han is not that far from the loyal Sam's relationship with Rick in "Casablanca." But "Solo" isn't really interested in pursuing the analogy. And so, although it raises the issue of marginalization and tokenism, the script abandons the issue for the status quo. L3-37 and Chewbacca quickly end their brief bid for autonomy, and return to their supporting roles — with even less freedom than before, in L3-37's case. It's possible that at some point the proliferating Star Wars franchise will get to a story centered on Chewbacca — or on L3-37 for that matter. If there is a "Chewbacca: A Star Wars Story," film, though, it will almost certainly have some other supporting character off to the side who inexplicably follows orders and puts their own life on standby in order to advance the plot arc of the star Wookie. In other words, for Chewie to finally get to be a star, the former sidekick will have to have his own sidekick. Movie protagonists are supposed to be larger than life — and one way that they're marked such is by making everyone around them smaller. Chewbacca looks like a giant beast, but really he's just a fuzzy step-stool that Han can stand on to make himself look cooler and braver. In Hollywood, some people are important because some people aren't. Chewie is one of those who isn't. Except perhaps in my heart, where he's still the one who gets to tear off Darth Vader's head. Read more: Is Star Wars' 'The Last Jedi' science fiction? It's time to settle this age-old argument.